DRAFT SALES PARTICULARS AWAITING VENDOR APPROVAL. Don't delay viewing this immaculately presented modern style end Town house arranged over three levels offering four bedrooms and occupying a larger than average plot being situated in a popular cul-de-sac location. The property is ideal for the growing family as it offers generous accommodation and benefits from a gas central heating system and uPVC double glazed windows and external doors. In brief detail the accommodation comprises: an Entrance Hallway, ground floor Cloakroom WC and a beautifully appointed fitted Dining Kitchen with French style doors leading to a Conservatory overlooking the rear garden. 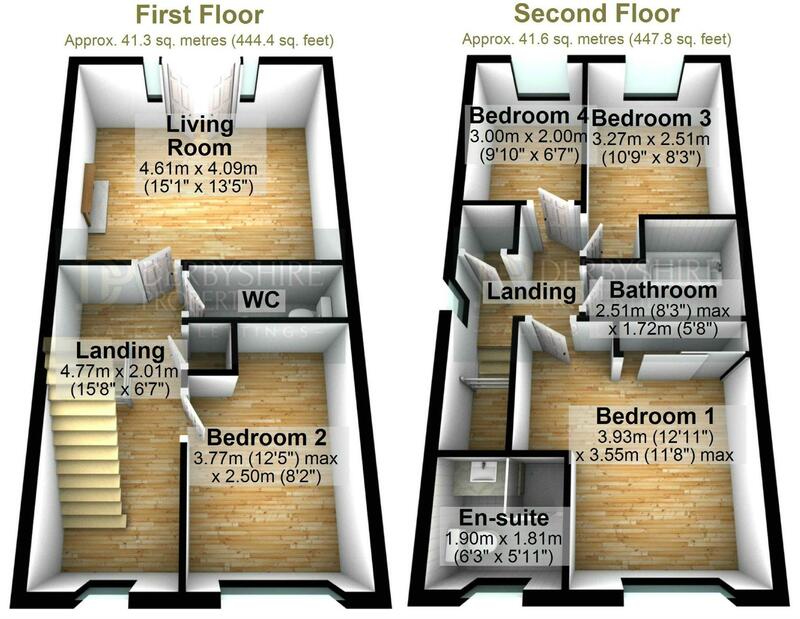 On the first floor there is a Landing area with access to a spacious Lounge with Juliet style balcony, guest cloakroom and Bedroom and stairs provide access to the second floor which has a Master Bedroom with En-suite shower room facilities, two further Bedrooms and a family Bathroom. Outside, the property sits on a good sized plot with parking for three vehicles and an integral Garage. There is a good sized side and rear garden area with a decked seating area. IDEAL FOR THE GROWING FAMILY. Riddings is a popular village location and offers a rang of amenities within the immediate area including infant and junior schools, community centre and large park area. There is a Co-operative supermarket close by and a regular bus service. Alfreton is a short distance away and there are also good road links to the M1 and A38 making the area ideal for commuting to the larger Towns of Mansfield, Chesterfield and Derby. 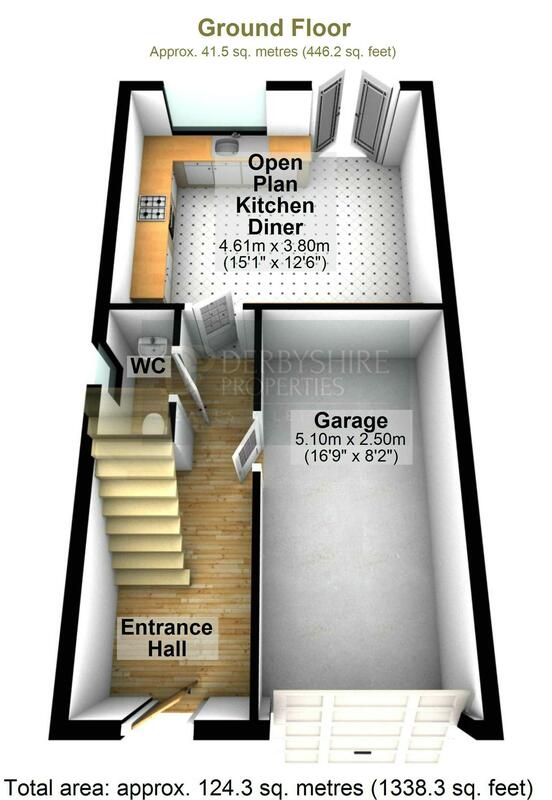 The property is approached via a composite front entrance door leading into the entrance hallway having stairs to the first floor accommodation, central heating radiator, porcelain tiled floors which continue through to the dining kitchen, door leading to garage and access to a ground floor cloakroom. With a uPVC double glazed window to the side elevation, fitted with a two piece suite comprising low flush WC and wash hand basin, central heating radiator and tiling to the splashbacks. 15' x 12' 6" (4.57m x 3.81m) Beautifully appointed with an extensive range of modern wall and base units with complementary work surfaces over incorporating a stainless steel sink and drainer. There is a built-in electric oven with gas hob and extractor hood over, integrated dishwasher , washing machine and fridge/freezer, inset spotlights to the ceiling, television point, central heating radiator and French style doors leading to a conservatory. 8' 6" x 7' 8" (2.59m x 2.34m) having double doors to the side giving access to the rear garden, having a brick base, wall light points, central heating radiator and tiled floor. A galleried landing having stairs to the second floor accommodation, uPVC double glazed window to the front elevation and central heating radiator. 14' 8" x 13' 5" (4.47m x 4.09m) having a Juliette style balcony with double doors and matching side panels, central heating radiator and television point. Fitted with central heating radiator and a two piece suite comprising low flush WC and wash hand basin. 12' 5" x 8' 2" (3.78m x 2.49m) having a uPVC double glazed window to the front elevation and a central heating radiator. Having a uPVC double glazed window to the side elevation, large built-in wardrobe, access to the loft, a central heating radiator and doors to bedrooms and bathroom. 12' 9" x 11' 4" (3.89m x 3.45m) having a uPVC double glazed window to the front elevation, central heating radiator and televsion point. Fitted with a modern white three piece suite comprising shower enclosure, low flush WC and wash hand basin set in a vanity style unit with storage cabinet beneath, extractor fan, uPVC double glazed window to the front elevation and central heating radiator. 10' 9" x 8' 3" (3.28m x 2.51m) 10'9 x 8'3 having a uPVC double glazed window to the rear elevation and central heating radiator. 9' 5" x 6' 5" (2.87m x 1.96m) having a uPVC double glazed window to the rear elevation and a central heating radiator. Fitted with a three piece suite comprising panelled bath, low flush WC and pedestal wash hand basin, complementary tiling to the splashback areas and an extractor fan. The property is situated on a good size plot with a driveway providing access to a garage, additional parking at the side of the property and gated access leads to the rear. A single integral garage with up-and-over door, power and light and door providing access to the main property. Larger than average rear and side gardens being mainly laid to lawn with mature borders and a decking/seating area.